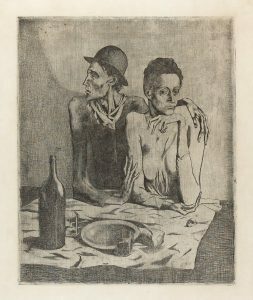 In the hands of Picasso, the most innovative printmaker of all time, the print medium gave rise to unique and breathtakingly beautiful artistic expressions not at all eclipsed by his achievements in painting, drawing, or sculpture. And just as he invented countless new artistic styles, so he created all sorts of unprecedented, and unknown, printmaking techniques. 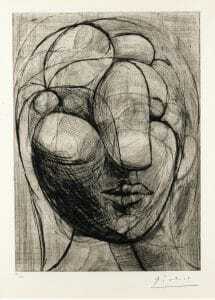 In fact, in terms of the technique of creating art, he was at least as inventive in printmaking as in any other medium he explored. Picasso had never been taught printmaking in art school. In 1899, at age 18 and while still living in Barcelona, he created his first print, an inconsequential trial etching with only one extant impression. Five years later, after he had moved permanently to France, one of the artists with whom he lived in Montmartre apparently helped him refine his engraving and etching skills. He then hit the road running with his first print that year, Le Repas Frugal. This Blue Period work is considered one of his masterpieces in any medium and arguably his most famous print, a testament to a genius who could master a new medium so readily and so completely as to emerge at its pinnacle by the time he had completed a single work. 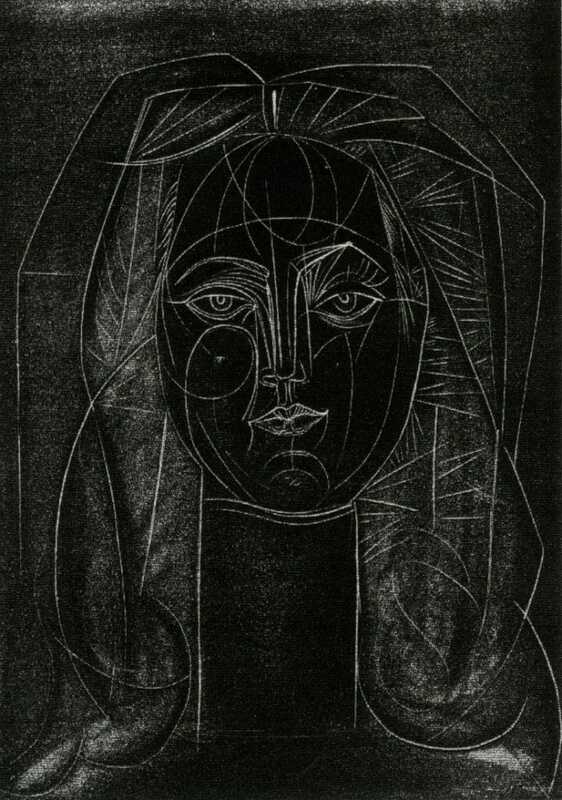 Apart from a few prints that he pulled by hand, Picasso spent the vast majority of his printmaking career collaborating with the best printers of his times. These included luminaries such as Lacourière for intaglio printing, Mourlot for lithography, Arnera for linoleum cuts, and for his late etchings, the Crommelynck brothers. Their talent was considerable, and their contribution to his printmaking was significant. People often think of prints as an artist’s way of mass-producing art and thereby tapping an extra source of income. But if you think about it, this must have been the furthest thing from Picasso’s mind. Picasso died far richer than any other artist in history. Yet he had no use for his wealth beyond a certain point—the amount needed to keep him in paints, canvases, and villas. In fact, he actually had a financial disincentive to make prints. His prints were often much more complex than his drawings and many of his paintings. If you further consider the innumerable states he often took his prints through, you would conclude that the average print required a much greater expenditure of time than most drawings and more than a fair number of his paintings. Proofs were pulled between the often numerous states of his prints, though usually in very small numbers (often singly). Between states, in order to achieve different effects, he tortured his plates and stones in various and increasingly innovative ways, all the while recording his wondrously transformative quantum bursts of creativity. This was clearly not a commercial venture. His print editions were also tiny (fifty, typically), and, in his day, his prints sold for peanuts, clearly not a product that could have made a dent in his vast wealth. 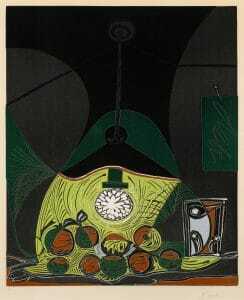 There is an added dimension of the importance of printmaking for Picasso, though admittedly not one that he is known to have specifically articulated. Picasso imparted the following thought in 1935 to Christian Zervos, his friend and chronicler, “It would be very interesting to preserve photographically, not the stages, but the metamorphoses of a picture. Possibly one might then discover the path followed by the brain in materializing a dream.” It seems to me that Picasso most thoroughly accomplished this ideal in printmaking. Prints provided a medium well suited to his method, since, by burnishing or scraping, he could subtract detail. As he said to Zervos, “In the old days pictures went forward toward completion by stages. Every day brought something new. A picture used to be a sum of additions. In my case a picture is a sum of destructions.” It is hard to imagine that Picasso was unaware that the restless explorations of his creative process were immortalized in his prints. At times, even Picasso’s innovative printmaking technique itself was charming. For a sculptural depiction of Marie-Thérèse (Tête de Femme, 1933, Bloch 256), he employed her fingernail polish as a sort of resist with which he drew directly onto the raw copper plate. 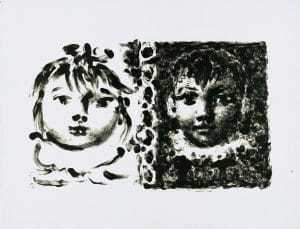 Another example of a touching technique is the portrait of his children, Paloma et Claude (1950, Mourlot 186, Bloch 664). He accomplished this tender lithograph by finger-painting on lithographic transfer paper, thus amusingly adapting a childlike technique to the depiction of children. Though Picasso starved his print audience for color, he made occasional exceptions, including several color lithographs and a larger number of linoleum cuts he undertook late in life. Linocuts are a reductive technique much like woodcuts, though the medium is softer and therefore easier to gouge. You gouge out the parts you don’t wish to be inked. What’s left in relief on the plate is what gets the ink. (This is the opposite of so-called intaglio prints such as etching, drypoint, and aquatint, in which the depressions on the copper plate trap the ink and transfer it onto paper.) In Picasso’s case, unprecedented in the history of printmaking, the final print was created from only one plate, regardless how many colors he used. Here’s how he did it. He first carved the plate, and then the entire edition was printed with the first color. (In many cases, the paper had been first printed with a background color prior to any cutting of the linoleum.) Then Picasso reworked the plate, and what was left still standing in relief was inked with another color and printed yet again onto the entire edition. This process was repeated as many times as the number of colors. 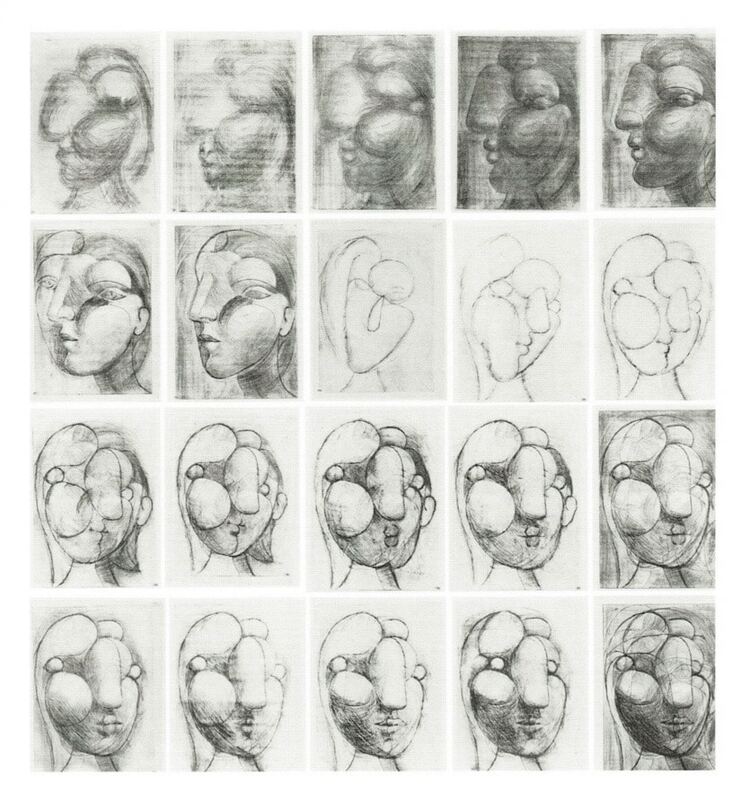 Picasso’s genius was the ability to hold the finished design in his mind from the outset and throughout the process, because each successive reduction obliterated details of the design from the plate. Accordingly, the final states of the plates, which still exist, often bear little discernible resemblance to the overall design. The final testament to Picasso’s love of printmaking was the plethora of prints that he created in his final years, at a time when he surely knew his days were numbered. In particular, he created his two largest series of prints in this last period, namely, The 347 Series in 1968, aptly named for, you guessed it, the number of prints it comprised. 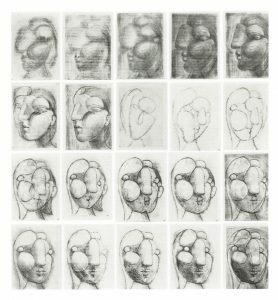 To gauge the importance of printmaking for Picasso, one need only compare this output to the sum total of all of his unique works of 1968, which is to say his paintings, drawings, and sculptures, which equaled 250. Finally, there followed The 156 Series of 1970-72, completed almost within a year of his death. 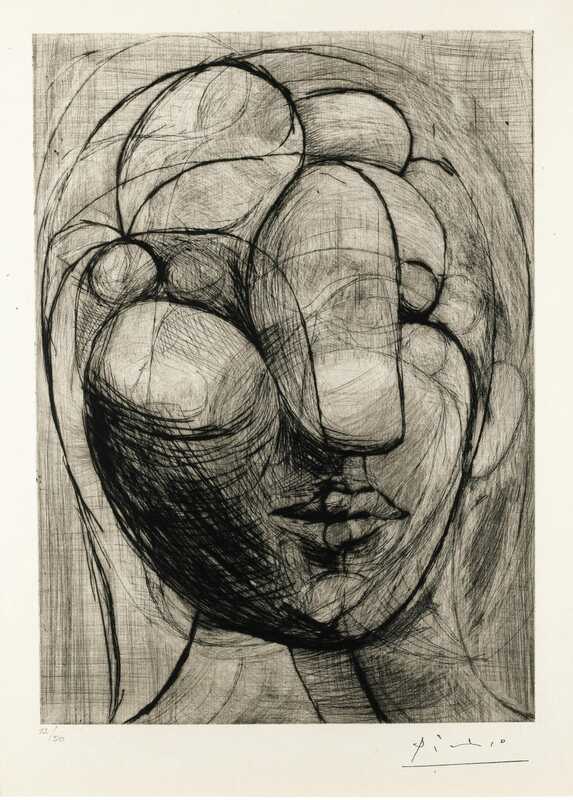 Whereas the brushstrokes of Picasso’s paintings of the period are the largest, and the depictions are similarly among the sparest, of his long career, the prints in contradistinction involve as fine a line as ever. Picasso seems to have been saying through these prints that even as a nonagenarian he still had a razor-sharp gaze and steady hand—if his paintings tended toward abstraction, that was not a product of his old age. On the contrary, it was by choice.